The Midland & Great Northern Joint Railway came into being in 1893, when the Eastern & Midlands Railway, having over extended itself financially, was jointly taken over by the Midland and Great Northern railways. The E&MR main line linked the Midlands and the North of England with the popular Norfolk coast resorts and its acquisition enabled these two railways to reach deep in to the heart of Great Eastern Railway territory. Following the joint takeover, the Midland assumed responsibility for the motive power whilst the GN looked after the signalling and permanent way. The line was run by a Joint Committee, the representatives of the MR and GNR giving way to those of the LM&SR and L&NER after the 1923 Grouping. It was only when the line was ceded to the L&NER in 1936, however, that it began to lose its independent identity, with the locomotive department seeing the M&GN and ex-Midland types replaced by those of the L&NER and constituents. 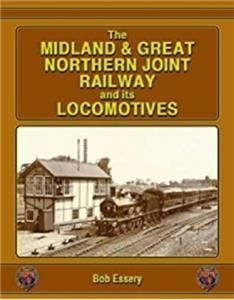 The locomotive history of the Midland Railway has been extensively covered by the author, in conjunction with the late David Jenkinson, in a four volume series published in the 1980s. At that time, it was intended to carry on and cover the locomotive histories of the London, Tilbury & Southend Railway, which came in to Midland hands in 1912, and of the two Joint lines which came under Midland control, the M&GN and the Somerset & Dorset Railway. The former came out in 2000 but the latter two lines still remained to be covered. This detailed profusely illustrated history of the Midland & Great Northern Railway, and in particular its motive power right from the very early days of the companies which grew to form it, therefore fills another important gap in the locomotive history of the Midland Railway. The text includes much new information which has come to light in the last twenty years, adding to the research previously carried out in the 1980s, whilst much of the illustrative content, including numerous detailed plans and a plethora of historic original photographs, has not previously been published. The majority of the M&GN system was closed in 1959 and, today, the only surviving section is that operated as a preserved line by the North Norfolk Railway, who do much to keep the memory of the old company alive. This volume is therefore a timely addition to the history of this most distinctive of railway’s, which will be appreciated by enthusiasts, modellers and railway historians alike. 192 pages hardback.